The new term has put a spring in my step. I have never really understood why people talk about fresh starts in January – for me, Autumn is the time when I feel energised, enthusiastic and ready to start again. So the children are finally back at school and I’ve just about re-established contact with the bottom of the laundry pile, and at last I feel able to have some ‘me’ time. It’s been ages since I wrote here, but that’s because we spent most of August camping in Scotland (well I know that might not suit everyone, but we had the best time imaginable). It’s my intention to scatter the odd post about the holiday on my other blog Mostly Motley from time to time, so if tales of wet walks up mountains, soft golden sandy beaches and castles galore are your thing, do pop over there occasionally and have a look. But this blog is my creative space, so it’s time for a quick update. Well full of good intentions, I actually took a small bag and some tapestry supplies away with me, thinking that I would sit and watch the sunsets, whilst putting in a few stitches. But in truth, I never actually took out the contents during the whole holiday. The fact is that we were either too wet or too tired to sit outside very much, and on the occasions when we did, I found that simply gazing at the views was enough. Oh and I suppose that having to move around quite a lot to avoid being midge fodder was an additional disincentive. I did however, take a lot of photographs of the sort that my husband calls ‘arty’, but are in fact simply pictures without him or our daughters in them. I also spent a great deal of time just looking. The scenery on the West Coast of Scotland is unsurpassed in my opinion. Ever since I was a small child, going there on holiday with my parents, the combination of mountains, lochs and the sea has had me in thrall. We drove to the Corran Ferry through some of the most atrocious rain we’ve ever experienced, but as we got to Glen Coe, the rain disappeared and the weather changed. We got out of the car to stretch our legs before the ferry arrived and tears came to my eyes, it’s just unspeakably beautiful and I felt that I was being welcomed back. 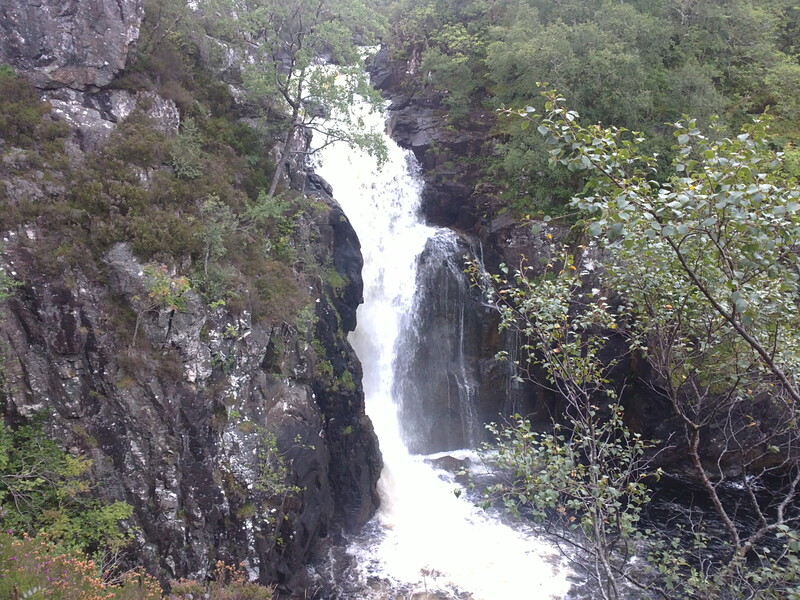 After three weeks of Highland scenery, I feel well and truly re-energised. My inspiration levels are topped up and at least for a while I’m calm again. For two years now, I’ve been mangling my brain, trying to fit my square career experience into the round hole that is the real me, and I think that I might now have tipped the balance properly and decided not to beat myself up any more, (well I expect the occasional relapse), but no more attempts to come up with the perfect solution. For now, I’m going to be nice to myself and see where it takes me. My Autumn resolution is to draw and paint every day. I can’t do that when the family are at home, so I’ll make time during the day. At night, I’ll always be able to sew – that remains my best therapy. It’s been thirty-three years since I gave myself permission to draw and paint just for pleasure – I wonder what’s lurking inside. Anyway, enough of this introspection. 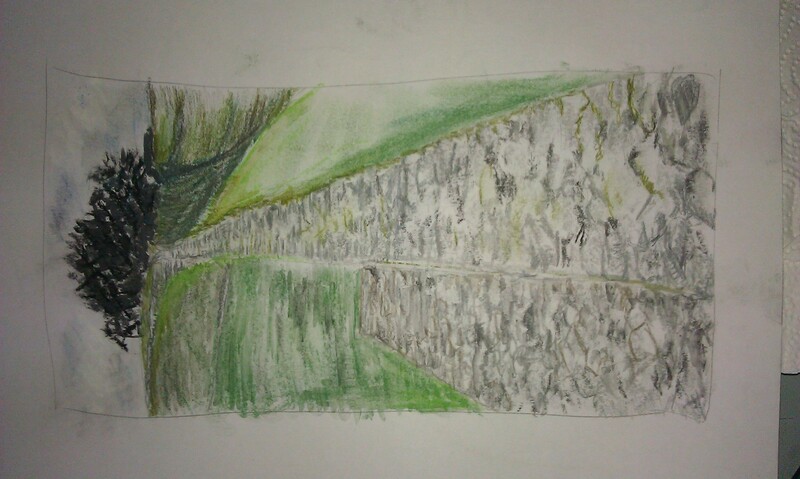 Here is a pastel sketch of Hadrian’s Wall from a picture I took while we were there. I did it yesterday. Well, it’s a start! Thank you Jill. You’re right, I find myself much more in tune with the rhythm of the pagan wheel of the year.